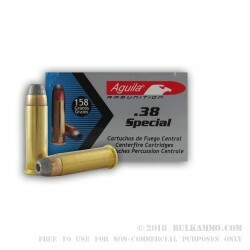 An exceptional quality 38 special ammunition with a heavy bullet in a nice configuration for defensive minded shooters that want to shoot (or need to shoot) a non +P ammunition out of their defensive firearm. Most lightweight framed compact revolvers do not allow for the +P varieties of .38 Special and as such, this heavy bullet in the SJHP (Semi-Jacketed Hollow Point) design is a very good option. You wouldn’t think this, but the round in this configuration is somewhat difficult to find from many producers, and so, Aguila has a real winner on their hands that always seems to be sold out. It’s for good reason. The ballistics are great for a non +P round, and the high reliability of the load makes it an excellent choice for most .38 Special shooters. This ammo offers a muzzle velocity of 900 feet per second and a physical energy of 284 pound feet at the muzzle gives this product enough power to keep threats at bay. The obvious high standards and best practices of the Aguila factory are built into this excellent cartridge, and you can trust that it will be a good experience shooting it. 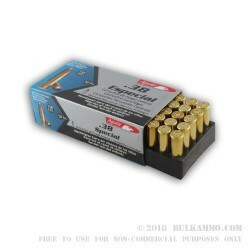 Suitable for use in all .38 Special firearms.